In its fifth year, Swachh Bharat Mission (SBM) has led to a paradigm shift when it comes to solid waste management. Stakeholders in cities across the country were sensitised on the importance of solid waste management – through programmes, cleanliness drives, workshops, competitions, rallies etc. It was only in its third year that an all India segregation campaign, Har din do bin was launched on June 5, 2017. Under SBM, cities have to ensure 100 per cent source segregation within one year, which is a challenge and yet has been a game changer wherever implemented properly. Is segregation sustainable under SBM? As per SBM August 2018 data, 43 per cent of the total wards in the country are segregating their waste at source. In 2017, door-to-door collection coverage increased from 53 per cent to 80 per cent . But what do the figures mean? The cities have limited the practice of segregation to the distribution of blue and green dustbins but has not made sure there is an end-to-end segregation infrastructure in place. In many cities, collection of segregated waste has started; however, often mixed waste ends up in the dumpsite. 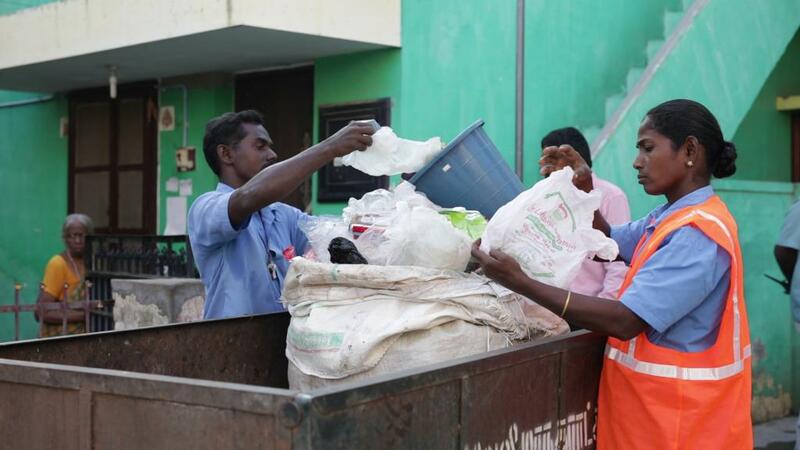 For instance, in Tirunelveli, a city in Tamil Nadu awarded by the government for implementing 100 per cent source segregation, households segregate only recyclable plastic and give it to the collector on a designated day. Mixed waste is collected on a daily basis when SWM Rules, 2016 mandate that waste be segregated into wet, dry and domestic hazardous distinctively. Cities such as Panchgani, Ambikapur, Vengurla, Panaji, Indore, Mysuru, Muzaffarpur created systems to support segregation. In these cities, the segregated waste is taken to the processing centre where compost is made from the wet waste, and only inert waste goes to the landfill. But most of the country is not segregating in its true spirit. How much collected, how much treated? Of the 1.45 lakh tonne of waste generated per day (TPD) in India, 49,401 TPD (34.07 per cent) is being processed. Just within the past 10 months, the processing capacity has increased from 24 per cent to 34 per cent. However, this also includes the non-operational and under construction plants. Also, majority of the processing centres in the country take mixed waste and are based on cost intensive centralised systems. The total waste that is processed takes into account the incoming waste that comes to the plant every day; however not all of this is processed. This further compromises on the quality of compost, RDF and recyclables. Adopting a decentralised model helps cities manage waste better. Muzaffarpur, Bihar adopted a zero landfill model, and now has two processing centres which take segregated waste from 34 wards of the total 49. This has led to savings in transportation cost and the local municipality is earning revenue by selling compost. Also, collector gets incentivised for the dry waste. 42 urban local bodies of Bihar were recently asked to adopt a similar model. Many cities in Chhattisgarh are likely to follow the example of Ambikapur. As per SBM by August 2018, 616 wastes to compost centralised plants are operational in the country. In April 2018, SBM claimed that there were 145 functional compost plants in the country while 150 plants were under construction. However, there is no list or account of these plants available for public. A recent document by the Union Ministry of Urban and Housing Affairs on co-processing Guidelines on Usage of Refuse Derived Fuel in Various Industries says that there are 52 centralised composting plants operational in the country and another 147 are under construction. Although compost under SBM has caught the nation’s attention but India still lacks an appropriate market and implementation mechanism for the Policy on Promotion of City Compost. It was estimated that the new federal incentives for the production of city compost would boost the use of city compost amongst farmers. However, neither manufacturers/fertiliser companies nor the farmers seem interested in city compost due to high cost and questionable quality. Apart from a few fertiliser companies, who have received 50 per cent of the ‘on account payment’, the majority of the manufacturers/companies have not got the subsidy. This has created a major hindrance in promoting city compost as envisioned. As per SBM, seven plants of 88.4 MW are operational Waste to Energy (WTE), but only five WTE’s are actually operational in India. Plants with power generation capacity of 415 MW are under consideration. One needs to relook on the viability of WTE in the country, considering there is only a limited fraction of waste that is fit for incineration- approximately 15-20 per cent of the total city’s waste as waste-to-energy plant can only treat non-biodegradable, non-recyclable high calorific value. These proposed plants collectively have more capacity to treat the waste than they viably can. Of the Rs 7,365 crores allocated for SBM for SWM, only 2126.24 crores (28 per cent) only have been dispersed so far. Rajasthan state has utilised maximum funds for solid waste management till date (94 per cent) but there is no significant waste management system on the ground in the state. Since cleanliness has become a movement like never before, this is the right time to address the bigger challenges- infrastructure, municipal capacity, corruption and social engineering in waste management. Although substantial work has been undertaken for capacity building and public awareness, the impact on the ground may be overstated. Priorities should be straight- segregate, collect and treat!